Here we come again with information about printable coupon from carter's. This amazing printable coupon allows you to take 25% off your purchase of $40 or more, or you can take 15% off your purchase when you spend less than $40. 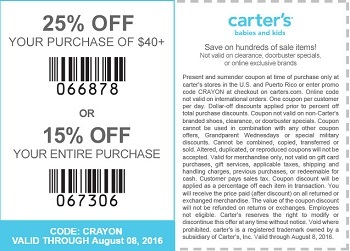 Coupon must be printed and shown during the time of your purchase at your nearest carter's store location in the U.S. Source of the information is carter's. Offer is valid until August 8, 2016. For more details visit any U.S. carter's store location.